A patient is attended by MSF's mental health team in Nauru. Almost all 900 asylum seekers and refugees on Nauru, including 115 children, have been on the island for more than five years, with no clear process or prospect of permanent resettlement. (Image Credit: MSF Australia). 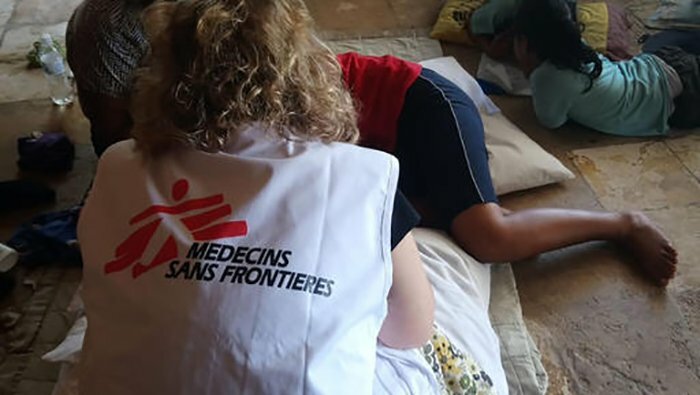 Médecins Sans Frontières/Doctors Without Borders (MSF) strongly condemns the government of Nauru’s sudden decision to cease the provision of desperately needed mental health care provided by MSF to asylum seekers, refugees and the local community on Nauru. The international humanitarian medical organisation describes the mental health situation of refugees on the island as “beyond desperate” and calls for the immediate evacuation of all asylum seekers and refugees from the island and for an end to the Australian offshore detention policy. “Separating families and forcibly holding men, women and children on a remote island indefinitely with no hope or protection except in the case of a medical emergency is cruel, inhumane and degrading,” said Paul McPhun, MSF Australia’s Executive Director.